Three crew members representing the United States and Russia are on their way to the International Space Station after launching from the Baikonur Cosmodrome in Kazakhstan at 4:05 a.m., EDT, Oct. 19. The Soyuz spacecraft carrying astronaut Shane Kimbrough of NASA, and cosmonauts Sergey Ryzhikov and Andrey Borisenko of the Russian space agency Roscosmos, is scheduled to dock to the Poisk module of the space station at 5:59 a.m., Oct. 21. NASA Television coverage of docking will begin at 5:15 a.m. Hatches are scheduled to open about 8:35 a.m. 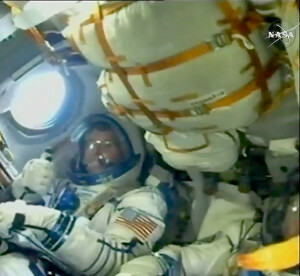 The arrival of Kimbrough, Ryzhikov and Borisenko returns the station’s crew complement to six. The three join Expedition 49 Commander Anatoli Ivanishin of Roscosmos, Flight Engineers Kate Rubins of NASA and Takuya Onishi of the Japan Aerospace Exploration Agency. The Expedition 49 crew members will spend a little over four months conducting more than 250 science investigations in fields such as biology, Earth science, human research, physical sciences and technology development. Kimbrough, Ryzhikov and Borisenko are scheduled to remain aboard the station until late February. Rubins, Ivanishin and Onishi will return to Earth Oct. 30. The Expedition 49 crew will welcome a variety of cargo deliveries to the space station, including Orbital ATK’s Cygnus, which launched Oct. 17 from NASA’s Wallops Flight Facility in Virginia. The spacecraft is scheduled to arrive at the orbital laboratory Oct. 23, with more than 5,100 pounds of science and research equipment, as well as crew supplies and hardware. Included in the Cygnus shipment are payloads that will study fires in space, the effect of lighting on sleep and daily rhythms, collection of health-related data, and a new way to measure neutrons. A Japanese cargo craft is scheduled to deliver new lithium ion batteries in December to replace the nickel-hydrogen batteries currently used to store electrical energy generated by the station’s solar arrays. The crew members also are scheduled to receive SpaceX’s 10th commercial resupply ship and two Russian Progress resupply missions delivering several tons of food, fuel, supplies and research. For more than 15 years, humans have been living continuously aboard the space station to advance scientific knowledge and demonstrate new technologies, making research breakthroughs not possible on Earth that also will enable long-duration human and robotic exploration into deep space. A truly global endeavor, more than 200 people from 18 countries have visited the unique microgravity laboratory that has hosted more than 1,900 research investigations from researchers in more than 95 countries.